Just when it seemed I couldn't be more of a freak than I already was, I went and made myself freakier. I came out of the closet and crossed to the other side of the fence. The pantry closet and the farmyard fence, that is. I am a...(duh duh DUH!)...Vegan. This isn't the first extreme thing I've tried. I have long struggled with extra weight and a terrible body image. I have tried different ways of eating, and of not eating. I've spent thousands of dollars on medical weight loss plans, shakes, pills, you name it. Some things have helped short term. But I can't seem to maintain anything that is extreme. Especially if I am extremely starving the whole time. A few years ago I did successfully lose 40 pounds. I wish I could say it was due to exercise and a healthy diet, but it wasn't. It was thanks to HCG injections. It seemed controversial, but I have to admit it was the only thing that has worked. My (very holistic medical) doctor recommended it. He knew it would work, because I lost weight while I was pregnant, the only other time I have had HCG coursing around in my system. It was amazing to finally successfully lose and keep off weight. It felt great. But you can't keep taking HCG and eating 500-800 VLF (very low fat) calories a day forever. Eventually I started eating again. I was good for awhile. Then slowly I started gaining again. Even while I was working out twice a week with a trainer. That sucked. I got lazier. Last year I started eating things I had long avoided. Fried things. Fatty things. Sugary things. I even started buying (gasp!) fast food, and even processed food that came in (double-gasp!) BOXES! I knew my clothes were getting a little snug and my energy was decreased, but I kept going down that road. I felt like I was trapped, headed back to a place I thought I had left for good. Then three weeks ago I got on a scale and got a shock. In a matter of months I had crept up precariously close to 200 lbs again. I swore I would never see or go past that number again. It got my attention. It shouldn't have been that big a shock. I knew I felt like crap. I was eating a lot of candy and sweets. The more I ate, the more I wanted. I was hungry all the time. I wasn't exercising because I was tired all the time. I was tired all the time because I was eating crap and not exercising. So what do you do these days when you need inspiration? You troll the Internet. I started doing research and going down the typical rabbit holes, until somehow I found this crazy Aussie who calls herself Freelee the Banana Girl. Why Banana Girl? Because she sometimes subsists on bananas all day long. And probably because everybody needs a hook, and what is sweeter and cuter than a banana? At first I thought she was a hyperactive nut. All vegan eating? Bananas all day? Perky in the morning? I watched a few more of her vlogs. I read her webpage. She started to grow on me, despite her perky ways. The way she ate wasn't complicated. There wasn't a lot of measuring or denying, no complicated recipes or expensive foods, not even any ads to buy her exclusive products (because she doesn't have any). Just a girl who found a healthy way to live and had tons of energy and wanted to share the message with the world for free. And who also enjoyed buying that "over" ripened fruit that no one else wanted at a bargain price...now she was talking my language! Maybe the bargain fruit shopping escorted the rest of her message through my thick skull, because suddenly the unthinkable happened: I considered going vegan. It seemed likely that it would help me lose weight. But mostly it seemed like a good way to get more plants in my diet and ditch the junk without feeling like I was in a dietary prison. 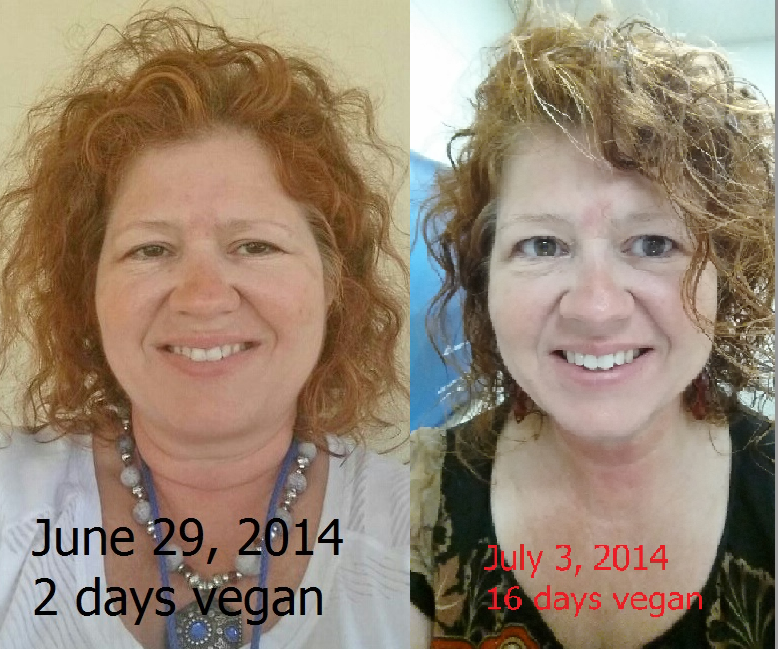 Two weeks ago I started eating a plant-based, mostly raw diet. No dairy. 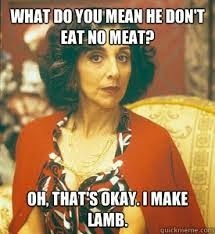 No meat. No processed foods of any kind. Me, the girl whose eating motto was "I'll eat whatever doesn't eat me first." Unfortunately, I think I was wrong about that motto. The things I was eating were eating me. From the inside out. I follow a "Raw Til 4:00" plan, eating raw plants (mostly fruit) until 4:00 pm, and then a cooked plant meal at night with starch. I'm never hungry. I have not had one craving for meat or for sweets since I started eating this way. I feel better, I think more clearly, and have lost 7 pounds. I definitely have more energy. I don't crash in the afternoon before it's time for bed. I even feel like doing things now, things like walking and dancing. I don't feel deprived. And everything I am eating is natural, not a hormone or powder or box in sight. Right now I am not morally opposed to dairy or meat. But I do have a problem with the ethics around the factory farm way of producing animal products. I had already started cutting mass-produced animal products from our diet in favor of locally sourced, humane products. I still make "normal" meals for my family. But as a result of my eating habits, they are getting the side benefit of eating more plants than before. For a lot of people, this seems sudden and extreme. I understand. Three weeks ago I felt the same way. However, as someone who has tried a lot of extreme things, this is one that makes sense on many levels. As they say, the proof is in the pudding. Frozen dairy-free raw banana pudding, which I will be eating here outside the closet.